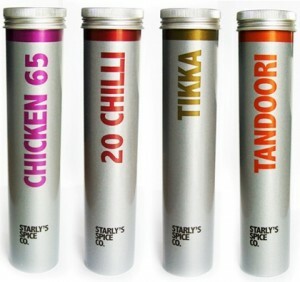 Aluminium packaging manufacturer Ashfield Extrusion Ltd are proud to present their stylish range of printed aluminium tubes for Cumbrian based Starly’s Spice Co.
Starly’s Street Food Range comprises hand blended spices in 4 different varieties: Chicken 65, 20 Chilli, Tikka and Tandoori, allowing the consumer to create tasty dishes from the streets of India in their own kitchen. Synonymous with high quality, aluminium provides an effective way to update an existing brand, draw attention to re-launches and promote a look of value. 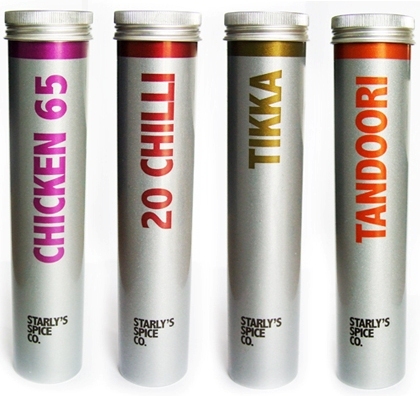 Starly’s chose Nottinghamshire based Ashfield to supply a 33mm diameter rigid aluminium tube with a screw cap, choosing from the wide range of standard sizes available and taking advantage of Ashfield’s in-house print expertise to maximise the visual impact of the packaging. Ashfield’s standard range offers 13 diameters from 20mm to 100mm with heights up to 230mm on some the larger diameters. Print options include matt, gloss and glitter finishes and various internal lacquer options are available to suit the pack requirements. This entry was posted on Monday, March 26th, 2012 at 3:47 pm	and is filed under Packaging. © ashfield extrusion 2019. Technical Performance Impact Extrusions. eCommerce Web Design by purpose media.